More than £300m is to be invested in training and defensive equipment linked to the introduction of the RAF's new transport fleet, it has been announced. 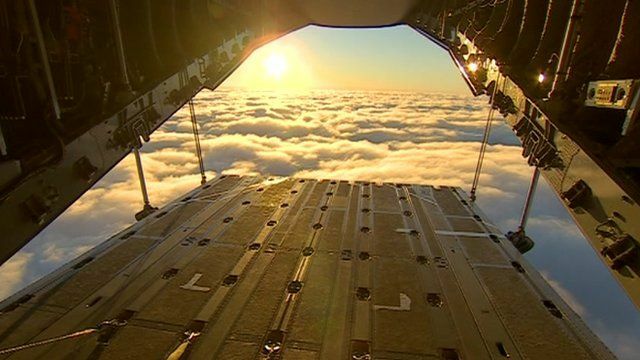 The MoD is buying 22 A400M Atlas transport aircraft to replace the RAF's fleet of C-130 Hercules planes, with the first aircraft set to enter service in late 2014. £226m will be spent on a specialist training school at RAF Brize Norton, where the aircraft will be based, while £80m will be used on the development, manufacture and installation of systems needed when the planes operate in hostile environments. The BBC's Jonathon Beale was the first UK journalist to take flight on one of the new planes. He spoke to Ed Strongman, chief test pilot Airbus Military, to find out more about its capabilities.